MOSCOW, December 1. /TASS/. The next World Chess Championship will be held in an Asian country, President of the World Chess Federation (FIDE) Kirsan Ilyumzhinov told TASS on Thursday. "There are two candidates, but I cannot name them. (The next host) will be announced at FIDE’s presidential council next spring. However, representatives of organizing committees that want to host the match in 2018 were in New York today," Ilyumzhinov said. On Thursday, Norway’s Magnus Carlsen won over Russia’s Sergey Karjakin in the tie-break 3-1 (total score 9-7). The match was held in New York. 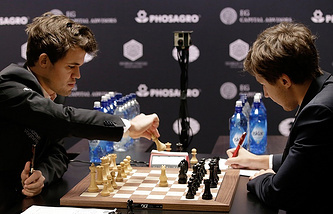 Their overall score after 12 games played was tied at 6-6 and both Grandmasters played a series of tie-break games to determine the new world champion.